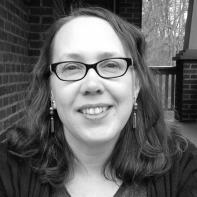 Caralyn Davis is a freelance writer for trade publications in the healthcare and technology transfer industries. This is her first creative nonfiction publication. Her fiction has appeared or is forthcoming in The Doctor T.J. Eckleburg Review, Eckleburg Anthology, Monkeybicycle, Relief Journal, Deep South, and The Drum and Side B Literary Magazine (2011 Dual Publication Award winner). She lives in Asheville, N.C., and is a former student in the Great Smokies Writing Program at the University of North Carolina-Asheville. I was making tea in the kitchen at the back of the house when I heard a boom followed by the tinkling sound of broken glass. A car accident on the street, that's what I thought. I jogged forward a few steps into the dining room, stopping short under my thrift-store chandelier. A gloved hand was coming through a pane of glass on my front door. The glove was knit with a thick, shiny white yarn and covered with brown leather patches on the fingers and palm. The hand was attached to an arm, nicely muscled and covered in a gray thermal T-shirt. The door was opening before the hand turned the lock. It had shattered in the frame to the left of the handle. Within the space of ten seconds, three men piled into my home. Two wore black ski masks; the third wore a black cloth coat with its hood pulled around his face. The masked ones carried long guns, some type of rifle, but the other had double-fisted weaponry, clutching both a handgun and a triangular knife that ended in a needle-like tip. At that moment, general consensus has since informed me, I should have acted. If I'd had a gun, my 82-year-old neighbor Mr. L— said, I could have shot the intruders. Yes, if I kept a loaded gun mounted on my dining room wall, I could have grabbed it, taken up a defensive position behind my gas stove inside the doorway to the kitchen, and engaged in a shootout worthy of John Wayne or whoever passes for an action hero these days. Another neighbor said I should have mapped out an escape route beforehand. Then I could have run for it. 1. Turn around and race through the kitchen to the back door. 2. Unlock the deadbolt and open the back door and the sliding screen. 3. Head onto the deck and back across the house in full view of three kitchen windows in order to reach the deck stairs. 4. Scramble down those unlit stairs that descend (unhelpfully) toward the front of the house. 5. Take a hard left across and down the sloping driveway to my back yard. 6. Go right through the neighbor's back yard in the pitch-black night. 7. Then up that neighbor's driveway to his front yard because he has no back door and an eight-foot drop straddles the next neighbor's back yard. Or, I could have gone through the kitchen to the basement door and faced a similar gauntlet of stairs, locks, and bad lighting. Either way, no problem. My manual dexterity and swift feet would have shocked the intruders into immobility. No one would have shot me, hit me in the head with the stock of a gun, or stabbed me with a knife designed for spearing human flesh rather than chopping flat-leaf parsley with flair. I should have called the police, a friend advised. But I didn't count a phone or panic button dangling from my neck as an essential fashion accessory while I was making tea in my own home on a Friday night in January. Running toward the men to reach a phone: I didn't consider that a wise choice. All would have been well if I'd had the forethought to own a dog, said the umpteenth person. When I was a 19-year-old student at the University of Georgia in Athens, I visited my older brother's girlfriend in Atlanta. W— wanted to take me somewhere special, and I agreed without a thought. I wanted her to like me so my brother might like me too. We picked up her artist-friend on the way, a man who spoke in formal textbook English. Down South, it's rare to hear a person use the words “whom” and “for which” aloud in a single sentence. His art involved taking body parts from road kill and arranging them in a tableau with colored cast-wax pieces. Or so he said. I couldn't see any of his work. It was in the freezer. So W—, the road-kill fetishist, and I went downtown, stopping on a deserted side street near a railroad track that went across a bridge. We hopped up and crawled, on hands and knees, across the trestle and through a hole in a fence. We passed a trampled no-trespassing sign to reach a factory. “Should we be here?” I asked. The crawling and signage had begun to clue me in. “Yes, this is a wondrous sentinel of the Industrial Age,” said the fetishist. Five minutes later, a growling, barking German shepherd cornered us against a metal wall. Three minutes after that, a security guard waved a gun in our faces and told us we had to go to the office. We walked, the guard and his dog keeping pace beside us. Less than 20 steps into our march, the dog lunged and bit me in the calf. Not W— with her platinum blond and blue Mohawk, three layered gauze shirts, '50s circle skirt, and black high-tops. Not the long-haired fetishist with his white ruffled pirate shirt and silver-and-blue harem pants. But me, in my mall-styled plain brown bob and my mall-purchased white, teal, and black shirt and coordinating teal cargo pants. The dog bit me just below my knee, which crackled from a bike crash that occurred when I was 10. I took a corner too fast because I was being chased by yet another manic German shepherd—a dog that had ignored my brother when he biked down the same street 20 minutes earlier. So I think it fair to ask: Would “my” dog have mauled the masked men, or me? One person said he kept a baseball bat by his bed to deal with such an emergency. Another said he opted for a fire extinguisher by his bed to fight off ne'er-do-wells. First, I wasn't in the bedroom. Second, despite my earlier ravings, I have the bare minimum of motor control required to qualify as an adult human with four functioning limbs. In other words, my ninja warrior skills that would allow me to fight off multiple men in hand-to-hand combat, let alone block bullets with wood or chemical foam, are sadly lacking. Regardless, neighbors and friends alike agreed that the arrival of these three men necessitated some action on my part. Here's what I did: I froze. “You froze?” even the kindliest inquired with a hint of disbelief. “Oh!” they said, each and every one, with a little laugh to indicate that that would never happen to them. Maybe not, but I can claim genetic predisposition. When my mother was four, she saw a man holding a gun looking in the living room window. She pointed at the window and screamed nonstop. She couldn't speak. Her father recommended slapping her to shut her up, but her mother closed the blinds and she calmed down. Years later, my mother learned that the lurking gunman, scared away by her screams, had been hunting her father, a gambling addict with no aptitude for the sport. I screamed too, but today's intruder is a heartier breed. The man in the hooded coat ran toward me with an unusual gait, hopping and skipping like he was participating in some quaint playground game from the 1940s. “Shut up, shut up,” he said. One of the other men closed the front door. The hooded man grabbed my arm and pointed a gun at me. I lost track of his knife. “Where is it? Where is it?” he said. Where is what?” I feel sure my face showed bewilderment as well as fear. “The money, the money,” he replied. Behind him, the two masked men went into the hallway off the living room. “What money?” I said. The tone of his voice and his use of the word “the” implied I was hoarding a treasure chest. “Where's the money?” He shook my arm. “Get it,” he told one of the others, who'd returned. “Come on. Sit down.” He led me, unresisting, to my living room chair, another thrift store find that I'd crammed next to my sofa. He sat me down and stood slightly behind me, still gripping my arm with one hand. “Do you live alone?” he said. “Yes, yes,” I said. Potential mistake. Perhaps I should have invented a lawman husband on the way home from the grocery store. I could hear crashes coming from my bedroom and the office/spare bedroom. My house was being ransacked. I realized that the barrel of the man's gun was pressed against the back of my head, a small round outline centered in that slight depression where the two halves of the skull meet. I had a sudden vision of a crucified frog in my mind's eye. In 1950 when my father was a teenager, my grandfather moved the family from the city to the country so the children could get away from the pre-packaged urban existence and experience “real life.” Real life included Daddy and his brother going frog gigging on hot summer nights. The sound of croaking bullfrogs was the signal to head for the creek about half a mile from their house. One brother carried a flashlight and a burlap croaker sack. The other carried the frog gig, a six-foot cane pole topped with a barb-tipped steel fork the size of a man's hand. The first boy shined the flashlight on the creek bank to catch a bullfrog's eyes, which glowed red. The second speared the frog with the gig, pulled its splayed-open body off the barbs, and dropped it in his brother's waiting sack. The boys would catch eight or 10 bullfrogs to make a good meal and then head home. They cut off the frogs' legs, the only edible part, on the roof of the dog pen in the back yard, slitting each leg so they could peel off the skin like a banana. “We wanted meat for the table,” my father always explained when he told the story. I wondered if these men considered their actions on par with frog gigging—necessary to put food on the table. Would they worry about leaving behind the odd human carcass? “In my purse. That's all I have. Take it.” I moved my head a bit so I could look him in the eye. I'd read a magazine article once about how crime victims should connect with assailants to force them to recognize that they're dealing with a human being. The gun shifted as I moved. We both heard my voice rising. I got worried that he might think I could recognize him. I broke eye contact and looked at the floor. The gun kept pace. “I'm calm. Please don't hurt me. Please don't hurt me.” It became a chant. “Shut up.” His voice got mean. “Where are your phones?” he asked me. “On the sofa and in the bedrooms,” I said. One of the other men came around in front of me, pulled the phone off the back of the sofa, and cut the cord. I still heard noises from the bedrooms and prayed my cat Henry would stay hidden. My neighbors expressed surprise that Henry didn't attack the men. They believe he's a tad feral given his tendency to growl low in his throat and stare at people like he's a lion and you're a zebra with a bad hoof. But Henry's not a lion. He's a cat, and if he'd gotten hurt taking on three armed men, calmness wouldn't have been a high priority. “Look for something to tie her with,” the man holding onto me said. The other two must have brought some unusable options because he said, “That's no good,” several times. He told one of the others to stay with me. His gun left my head, but a new circle pressed against my back between my shoulder blades. Then the original guy returned and stood in front of me. “Put your hands together,” he said. “Please don't hurt me.” I risked a glance up. He could have felt a twinge of pity for a pudgy, 40ish woman home alone on a Friday night, but I didn't see any emotion on his face. I believe he was inspired by the paintings in my living room. I'm not a fan of organized religion; it can turn people spiteful. But my mother is something of a Methodist scholar. She's also an artist. So everywhere this man's gaze fell as he held his gun to my head, it had landed on a painting filled with religious imagery: haloed angels, feathered wings, golden crowns, the Star of Bethlehem, and even a cross poorly disguised as a colored pinwheel. The man got down on one knee and tied my left ankle to the left leg of the chair. “Where's your cell phone?” he said. “Where's your cell phone? Where is it?” He'd raised his voice before. This time he shouted. “I swear, I don't have a cell phone. I can't afford one.” I felt like screaming myself. They were almost gone, and I was about to get my brains splattered across the living room floor because I'm technologically backward. “OK,” he said. “Let's go.” The second gun barrel slid away. The three men walked out of my house and pulled the front door closed behind them. I watched them go with the same sense of disbelief that I'd felt upon their arrival. My wrists came undone immediately. I couldn't untie the knot around my ankle. I got up and carried the chair with me a few steps. Then I sat down to try again. The man had tied my ankle to the chair over my thick wool sock. I worked my sock down my foot until there was bare skin, and that gave me enough room to free myself. Into my bedroom. The digital clock on the bedside table read 9:08. I checked the phone cords in my bedroom and my office—both cut. I looked through my already-opened desk drawers for a spare cord, but I couldn't find one. Scared to go outside, I went back to my bedroom and let four minutes pass on the clock. I counted them out: One, two, three, four. Deep breath, out the front door. I ran to a neighbor's house to call 911. “Usually, in these cases, the victims know the people somehow. Is anyone mad at you?” said the detective as I sat at my dining room table. The detective and the uniformed police officers milling around my home laughed. They thought I was making a joke. I wasn't. I'd moved to Asheville looking for quiet, and over the years I'd let the quiet devolve into stasis. “You're taking this really well,” said the detective. He seemed suspicious of my calm. “I'm alive, not even hurt,” I said. Unimpressed, the detective walked into the kitchen and called the station to do a record check on me. He didn't need to know that I'd been a bright, strange child, and I'd learned early on not to cry in front of people. The police left. The neighbors came. Several offered me a bed for the night. “I can't leave Henry,” I said. “I'll be fine here,” I said. After Hurricane Katrina, I'd decided not to desert Henry in the event of a natural disaster. I figured manmade disasters counted too. The neighbors took action. One boarded up the broken pane and rigged a padlock for the door so I could lock myself in for the night. Another donated a phone cord so I could call my parents. A third promised to take me to the home improvement store in his truck the next day so I could get a new door. Then I was alone. I clicked the padlock shut, pushed the sofa in front of the door, piled the chair on top of that as an extra barricade, and walked from room to room, crying as I circled the house several times. Finally, I poured myself a drink of the sherry I kept on hand to marinate tofu and sat down on the office daybed. Books, papers, and fingerprint dust littered almost every surface. Henry showed up and sat down next to me. He gave a small sigh and laid his head on my thigh. We stayed there side by side until daylight. A few years later, my peace has limits. Last night at 2 a.m., a power surge brought the office printer to life in a spate of clacks and whirs. I sprang from the bed, ready to act. How, exactly? I have no idea. Plans for handling unexpected violence don't always match up with the offenders' tactics. It's not a video game where a specific action on my part will produce a certain set of results. Guns, security systems, and other defenses can be met by bigger guns, bulletproof vests, and similar high-stakes criminal gear. The one thing I can do with certainty is to be more aware. Though the printer was a false alarm, I don't begrudge my pounding heart. I'm glad I'm alert to noises that never rise above the background for most people. My neighbors, kind as they were in the aftermath, didn't hear my front door implode or lay a single eye on the three armed men. Our houses are packed close enough that we can see each other's dinner plates when the curtains are pulled back. We don't want to intrude, so we've trained ourselves to ignore anything outside our comfort zone. That's changed for me. I look. I notice. Maybe one day I'll save myself—or a neighbor trapped in her own home, gun to head.